Acorn Outreach serves the immigrant & Latino community in Corvallis, Oregon through assistance with legal services, english classes (ESL), and job-training & education programs. 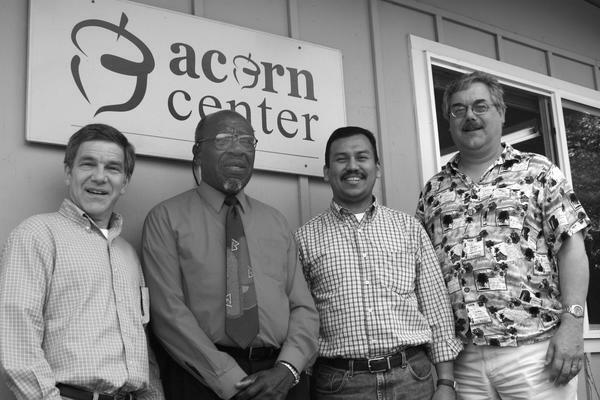 Our church has a close relationship with Acorn Outreach in Corvallis. Acorn Outreach was established when a small group of people at Calvin Presbyterian dedicated itself to prayer and to learning the needs of the community around us – particularly in the Hobart and Division street neighborhood. It was our desire to reach out in friendship to the people close to our church building. Thus Acorn Outreach was born. A duplex, located at the very heart of the neighborhood, was donated to Acorn Outreach and soon became the hub of all services. Join us as we reach across cultural and economic barriers to help build God’s Kingdom. The Acorn Outreach center is located at 1740 Northwest Division street in Corvallis Oregon. Please visit www.acornoutreach.com or call (541) 224-6590 for more information and find out ways to get involved!